As most of you are all aware, Hurricane Harvey turned out to be an extremely catastrophic disaster to Texas and the surrounding states. Houston, Texas was affected the most and as I continued to watch the news and coverage each day, my heart broke even more. Not many of you know this but, I used to live in Texas a few years back. I have friends there and people that I adore that I am friends with from blog-land. I knew that I just couldn't sit back watching the TV screen anymore. Just crying and praying. I HAD to DO something. So I teamed up with the American Red Cross NJ and spoke to their Special Events Manager, Aimee Alven and decided that I wanted to help raise money for all those families and pets that have been affected by this horrific storm. I know what it's like to get flooded as I live in a flood zone myself at the Jersey shore but I do not know what it is like to lose my job, my home, my vehicle and then some because of floods. 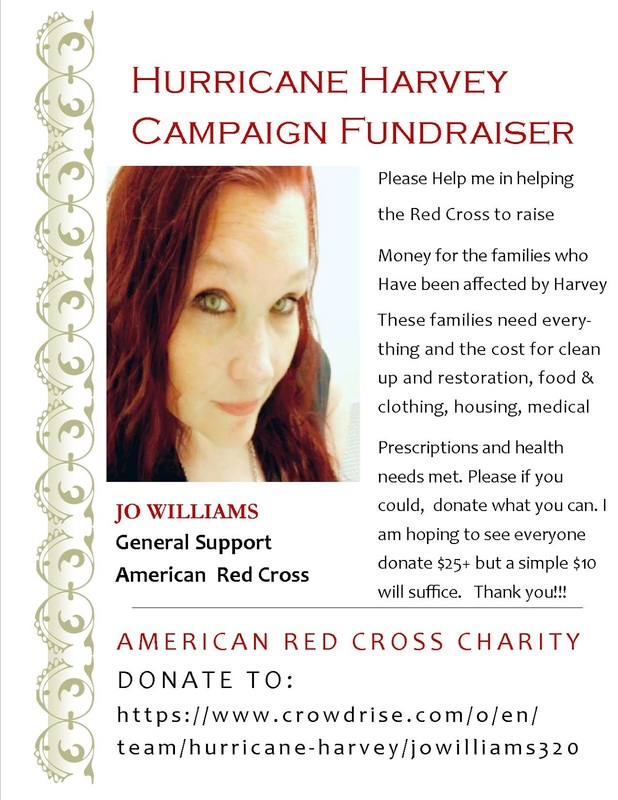 So I am asking each and every one of you, to please open up your hearts and help me and the Red Cross to raise as much money as we can, so that we may help these families. Our goal is to raise $25,000 or more! One donation at a time, one family at a time. Would love to see us reach that goal and even pass it! These families need everything! They need the basics, food/shelter/clothing. But the children need some new toys to give them a sense of comfort. Of what life was like before the storm. People need their prescriptions filled, that they were not able to grab in time before fleeing their flooded homes. Some people have medical and health needs that need to be met. What about the animals? Some pets are lost and are not with their owners. Some are strays. But nonetheless, they too, deserve to be rescued, fed and kept some place safe and warm. After the water is gone, there will be thousands of millions of dollars worth of clean up and restoration that needs to be done. Building expenses to rebuild. So while donations of clothing and food are definitely needed and appreciated, what these people need more than anything is money donations. So I am asking each of you to please donate what you can. And please share my link on your blogs, your Facebook and social media accounts and let's help the Red Cross raise more money to help these families. We go out and purchase crafting supplies all the time... so let's sacrifice that next stamp set or crafty tool and help a small child or a family in need. Let's do this, one donation at a time, one family at a time. I thank you in advance for your generosity and giving heart. And please know that ALL donations go directly to the Red Cross. I do not receive any monies for this at all. I am simply volunteering my time to do something to help. You may call the Red Cross should you choose to if you are wanting to know where the money goes. Thank you again! It will say that you are supporting me, but this just means you are on my team and you are helping to support me in my fight to raise money for this campaign. Again, all proceeds go directly to the Red Cross. Please share this link on your social media accounts. hope all that people will be fine. My heart and prayers go out to TX at this difficult time! It's wonderful for so many people reaching out to help. How kind of you to reach out, too! We have already donated through our church otherwise I would have donated here through the Red Cross. Hugs and blessings to you!